Chukar is a medium-sized upland game bird, closely related to red-legged partridge. It inhabits dry and relatively open hills and mountains, with some scrubs and vegetation. Chukar originates from the mountains of Asia, and its clicking calls can be heard from Asia Minor to Inner Mongolia. The bird has been introduced to North America, and it’s hard to imagine now that it’s not a native of the Rockies. You can hunt Chukar both in its original range, in countries like Tajikistan and Kazakhstan, and in the United States as well. Technically, the most affordable Chukar hunting opportunities exist in Kazakhstan or Tajikistan, where they cost about $300-$500 a day. However, since we’re talking about 5-8 day hunts, and with added travel costs, the bottom line will not be as attractive. Chukar hunts for released birds in the East of the US sell for about $1,000 a day. Perhaps the best value are hunts in the American West, where for $600-$800 a hunter a day you’ll get a guided hunt for wild birds over well-trained pointers and setters. 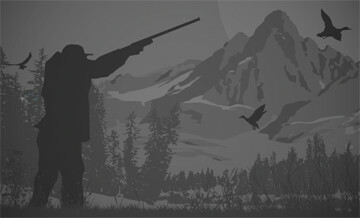 Hunters don’t often travel far to hunt birds - this is far less common, at least, than going places after big game. However, there are exceptions. Dove shooting in Argentina is legendary, and has made Argentina one of the most popular destinations for international hunters. If you’re only considering a dove hunt in Argentina, check out this blog post to help you prepare for it. June 15, 2017 How to Survive High-Volume Dove Shooting in Argentina. Chukar hunting seasons usually open in September or October, and close in December or February, although in some destinations or on private land preserves they can continue until April. The best time for hunting depends on the area, but in most cases it is believed that hunting gets better when winter strikes. But by far the most popular and sporting way of hunting Chukar is to walk up with pointing dogs. Be ready to do a lot more walking than shooting. One tip to bear in mind when hunting Chukar is that the birds will usually run uphill, but fly downhill. Sheep and goat hunters who visit the ranges of Asia are sometimes offered a Chukar hunt as an extra after they’ve bagged their Ibex or Marco Polo. Here the guides will usually resort to one of the old traditional methods of the Asian mountains. One is to sit for the birds over the waterhole and shoot them as they come to drink. Another option is to stalk the feeding coveys, approaching them from the other side of the hill and navigating yourself by their calls. Many jokes exist about Chukar hunting in the USA, all playing on the fact that the effort Chukar hunters put in is seldom justified by the size of the bag. Indeed, Chukar hunting is extremely demanding for both humans and canines. It takes a lot of walking over some very difficult terrain just to find a covey, and the birds are skilled at evading their pursuers. And once flushed, their strong flight (and your weary hands) make them quite a challenge for a shotgunner. But that’s another way of saying that it’s a very sporting hunt, and the more effort you put in, the higher the satisfaction from the result. The biggest attraction of Chukar hunting is, perhaps, the places it takes you to. Magnificent mountain ranges, almost entirely devoid of human presence, have a way of refreshing your mind like nothing else. Chukar hunting by stalking in the mountains. No bag limit for chukar trophies!